This is a luxurious heavily plated 18 carat gold centre frame that is designed to fit the Apple iPhone 4. If your original centre frame is scratched, scuffed or damaged, why not replace it with a brand new stylish 18ct hardened gold plated centre frame. This is an original official iPhone 4 centre frame that has been struck with .999 hardened 18 carat gold giving a hard wearing gold finish before being thermally sealed. 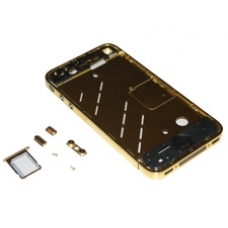 * Includes Gold Volume Button, Gold Silent Button, Gold Sim Tray & 2 x Gold Bottom Screws. * Thick Heavy 18 Carat Gold Plate.